Stock Market Analysis With The Elliott Wave Principle -Dow Jones, S&P 500, Russell 2000, Nasdaq and FX. All charts and commentary on this site are strictly the opinions of the author(s) and are for recreational purposes only. In no way should this be construed as trading advice or a recommendation for investing. See disclaimer at the bottom of the page. Been a while. "Life" has gotten in the way and honestly the market over the last several months since my last post was just churning in a wave iv. I think after breaking out in July this year, it finally looks like wave 3 may have completed. 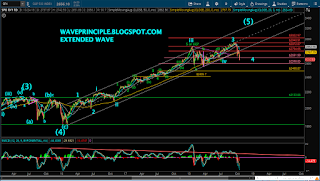 What the market may be doing at the moment is forming wave 4. What form will wave 4 take, i.e. flat, triangle, combo corrective? We shall see. 2520 would be a 38% retracement of wave 3 and bring wave 4 down near the lower levels of wave iv's previous triangle. We'll see if the market is shooting for this level. DISCLAIMER: THE INFORMATION PROVIDED HEREIN IS NOT TO BE CONSTRUED AS AN OFFER TO BUY OR SELL STOCKS OF ANY KIND. THE STOCK SELECTIONS ON THIS BLOG ARE NOT TO BE CONSIDERED A RECOMMENDATION TO BUY OR SELL ANY STOCK BUT AS IS A MERE FORM OF EXPRESSION ON THE WRITERS PART. IT IS POSSIBLE AT THIS OR SOME SUBSEQUENT DATE, WRITER MAY OWN, BUY OR SELL STOCKS PRESENTED HERE. ALL INVESTORS SHOULD CONSULT A QUALIFIED PROFESSIONAL BEFORE TRADING ANY STOCK. WRITER IS NOT AN INVESTMENT ADVISOR, NOR A SECURITIES BROKER. INFORMATION ON THIS BLOG IS FOR EDUCATIONAL PURPOSES ONLY. ALL MATERIAL PRESENTED HEREIN IS BELIEVED TO BE RELIABLE BUT WE CANNOT ATTEST TO ITS ACCURACY. READERS ARE URGED TO CHECK WITH THEIR OWN INVESTMENT COUNSELORS BEFORE MAKING ANY INVESTMENT DECISIONS.